Siemens has introduced the Sinamics G120X drive, said to be a simple, seamless and easy-to-use drive, designed for use in pump, fan and compressor applications in industries such as water/wastewater, HVAC/R, irrigation/agriculture and in industrial environments. 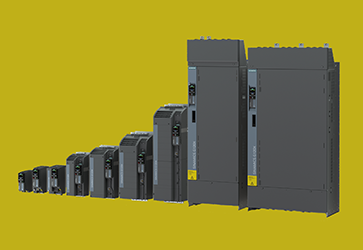 The Siemens drive has a power range of 0.75 to 630 kW and can operate from -20° to 60°C with any standard motor, including synchronous reluctance motors (SRM). It has an integral DC choke which improves harmonics and EMC performance. The unit meets the latest and upcoming UL, NEMA and EN/IEC standards for 2019 and beyond and offers up to 100 kA short-circuit current rating (SCCR) ensuring enhanced product safety and energy efficiency. The compact design of the drive saves space in the control cabinet and can also be easily integrated in to MCC solutions (including plug-in buckets). Even without an additional output reactor, the unit drives enable motor cable lengths of up to 150 m with category C2 or C3 filter and up to 1476 450 m without filter and have hardware-based SIL3-certified safety functions built-in. The drive operates using its high-resolution graphical color keypad, known as IOP-2 (intelligent operator panel), as well as the optional Wi-Fi-enabled Smart Access wireless module — both optimized for pump and fan applications.